I’m more of an Onion man myself, but if you get your at-work laughs from Dilbert, you might like to hear that the Dilbert.com website has gotten a bit of an upgrade. There are animated versions of Dilbert strips available, as well as an extensive expansion of the Dilbert archives that will eventually include every strip in history. There are three ways this works. The first, known as “punch line,” will allow readers to write their own ending to an original Dilbert comic, adding new words to the drawing for the last frame of the strip. This is a lot like the New Yorker magazine’s cartoon caption contest, except in the case of Dilbert.com, it’s not a contest but rather a way for readers to share their wit with the Internet. A second feature coming in May will allow readers to add their own words to an entire strip. 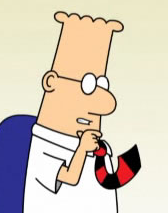 So, they’ll be presented with a fully drawn Dilbert comic, but will be tasked with writing the dialogue. And also coming in May, I’m told, will be a feature which will allow fans to write the dialogue for a single panel of a Dilbert strip and then share it with others, who will then write for the remaining panels. Adams himself is expected to randomly write dialogue for strips.